The 34th edition of BarCamp Prishtina came in a different dimension like never before. This edition covered topics related to neuroscience and offered answers to questions such as whether the brain is competent to ascertain the correctness of reality and know that is taking the right decisions?! How is scientific research conducted and what is its purpose? What are the factors that influence our decisions? Fascinating, huh? Taking place last Wednesday night at Oda Theatre, this edition focused on scientific research and the process through which our minds make decisions. And science freaks were not the only ones thrilled to listen to our guest speakers. The audience had the opportunity to make questions and learn things they probably never knew before. Two speakers involved in scientific fields were invited, specifically Naim Telaku and Ilir Mazreku. Naim Telaku, Professor of Neuroscience at the University of Pristina, President of the Association of Psychologists of Kosovo and co-founder of the Ambulance of Clinical Psychology UNI, talked about neuroscience, automatic actions, the ambiguity of free will, the difficulties of localizing consciousness, the (mis)perceptions of the human brain, and much more. Neuroscience shows that us that any stimulus to which we are exposed for less than 60 milliseconds, it may unconsciously influence our decisions. Naim also gave some advice in the form of conclusions, by urging others to not put barriers or frames unto one’s brain. 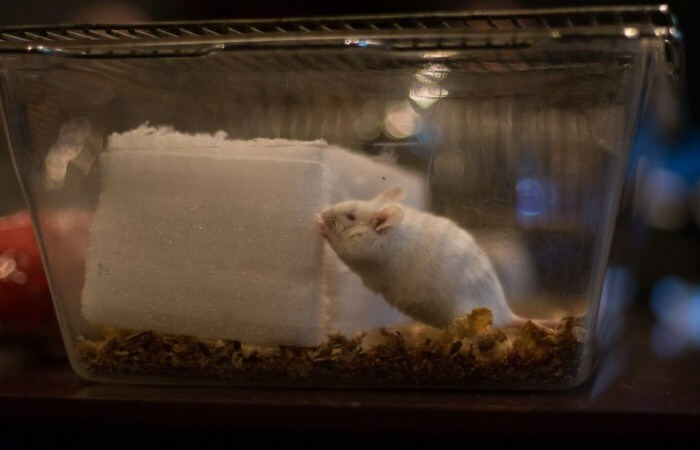 Ilir Mazreku, biopsychologist and Assistant at the University of Prishtina, whose daily work has to do with laboratory animals, among which mus musculus albino mice. As Ilir stated, “these are mice used for cancer discoveries because their genome is suitable for research.” Ilir showed how he deals with researching different aspects of the brain and mind in both behavioral and molecular levels, by using animal models. The aforementioned mice were also special guests of this BarCamp! In addition, Valon Nushi from UNICEF Innovations Lab Kosovo disclosed the opportunity of applying for UPSHIFT: Social Impact Workshop, a new dynamic model of three-days workshop that will bring together ideas, problems of youth and multiple educational innovative methods to solve different social problems within your community. Think like a proton and stay positive because our next BarCamp will bring you new folks and very interesting stories.